I know what you are thinking- that shirt again? Well I’ll have you know it’s become a literal staple to my current capsule wardrobe. Next thought- What is a capsule wardrobe? I’d love to say that I thought up this interesting idea, but alas I did not. A capsule wardrobe is where you take and break down the year by seasons and create a set number of clothes that you only use during that season. Jan-March is Winter, April-June is Spring, July-September is Summer, and October-December is Fall. There’s many variations of what types there are, but I landed on creating a capsule wardrobe for my every day life. I came across this late January so instead of doing 3 months for my first capsule I decided to challenge myself to a two month trial, February-March. What’s included in a capsule wardrobe? Not included: pajamas, undergarments, accessories, special occasion dresses and workout wear. Why do this? Because the idea behind a capsule wardrobe is that the less time you spend thinking, planning, trying to figure out what to wear or what fits, the more time you have to focus on more important things in life. For me that’s taking care of our precious one year old and heaven knows I could use all the time I can get! Also, if you are being honest with yourself- don’t you tend to gravitate towards the same things in your closet anyways? I know I sure did. So why not have a smaller, compact group of clothes that can be simply interchanged and can be easily thrown together? Plus less clutter=less stress. 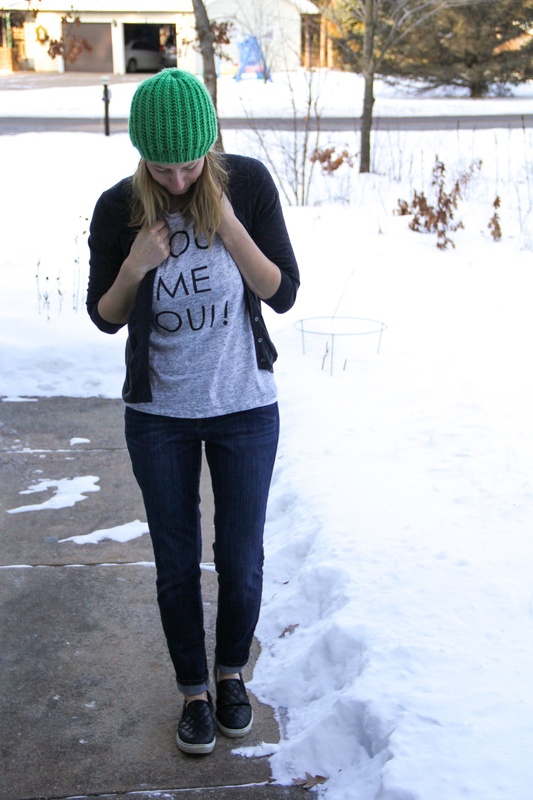 This is why I decided to give a capsule wardrobe a try. How many pieces are in your capsule wardrobe for a season? Many different people I researched had differing numbers when it came to how many pieces made up their capsule wardrobe. The most referenced site I used was Un-fancy. It’s an entire blog dedicated to capsule wardrobing. There’s some great tools and tips on how to get started- totally worth checking out if you wanna learn more. I used her worksheets which I found most helpful. Her magic number she uses is 37 pieces of clothing for each season’s capsule. I tried my hardest to get down to that number, but settled on 40 pieces for my trial capsule. In the winter I needed more boot options so that boosted my number. What do you do with the rest of your clothes? I literally went through my entire closet and tried on EVERY SINGLE PIECE. I sorted them into a piles of things to keep or things to sell/donate. If I hadn’t worn it in forever because something just wasn’t right about it or it didn’t fit me well, I got rid of it. What I kept I then sorted by sizes small, medium and large. Because I picture myself having more children some day, I thought it was only smart to keep clothes I still liked that were a little bigger for when I get pregnant again. I compiled my season’s wardrobe then from the clothes I chose to keep. The rest of my clothes were stored into 3 bins by size. The only thing I chose to hang back up that wasn’t part of my capsule were my dresses since we have the closet space to hang them and there didn’t seem to be a need to fold them up and store them in bins. I was very shocked at how much I was willing to part with and purge. It felt good! Also, it only took one day to go through it all and sort/ store. Here’s just a hint at how much stuff I got rid of. Like I said before, it felt good! Do you have to buy all new items for each new capsule wardrobe season? Absolutely not. One of the main points for a capsule wardrobe is to save money by using what you have. You get to transfer over the clothes you’d wear from one capsule to another if you really do wear them a lot. For me that’d be my skinny jeans. I’ll be using them all year round. That being said, adding in one or two new pieces for each new capsule season is totally appropriate. I personally don’t have a budget that would allow me to buy all new items and I wouldn’t want to anyways. It’s nice to build a wardrobe that I’m confident in and I always lean towards classic clothes that will last me for years. How’s it going so far? Being that I’ve done this now for the past 21 days or more, I can honestly say that I have thoroughly enjoyed this challenge. I actually don’t feel one bit lacking in choices for outfits. Having accessories like scarves or necklaces to mix things up totally makes the same outfit feel like a new creation. I chose a color scheme of mostly grey and black pieces with cremes and burgundy thrown in and the combos I’ve made have been really great. You may want to ask me again come the end of March. What’s been the biggest challenge? You may laugh or scoff at me, but the biggest challenge has been not shopping. 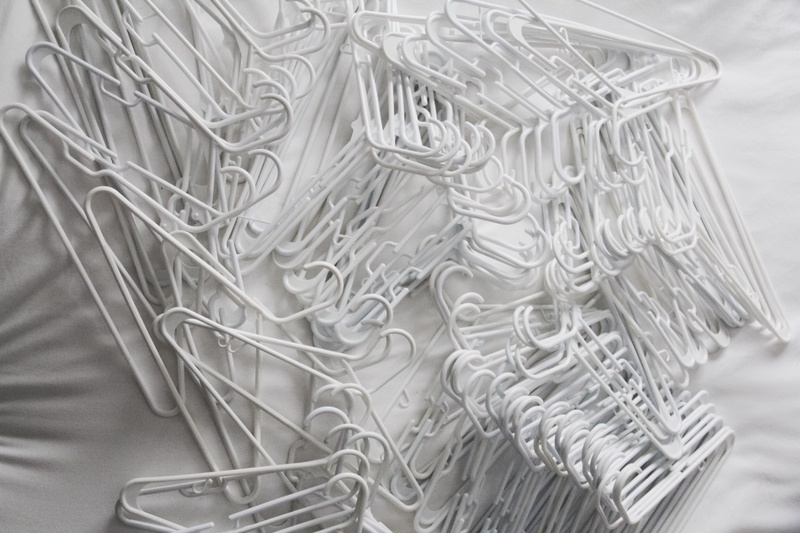 One guideline for capsule wardrobing is that you don’t shop during the 3 month capsule span. This is meant to free up time that you would otherwise use buying and spending. This saves you money also. In the last 2 weeks of your season, you start to plan, shop and make your next season’s capsule. So for me that will be the last 2 weeks of March. I am such a sucker for a clearance rack at Target or an email stating an extra 40% off sale at J Crew. To not browse or scour my favorite stores for a big bargain has been really hard. I am finding that I am not spending more money though by hanging tight and not giving into the temptations. Big win for our budget keeping skills! So now onto my outfit. 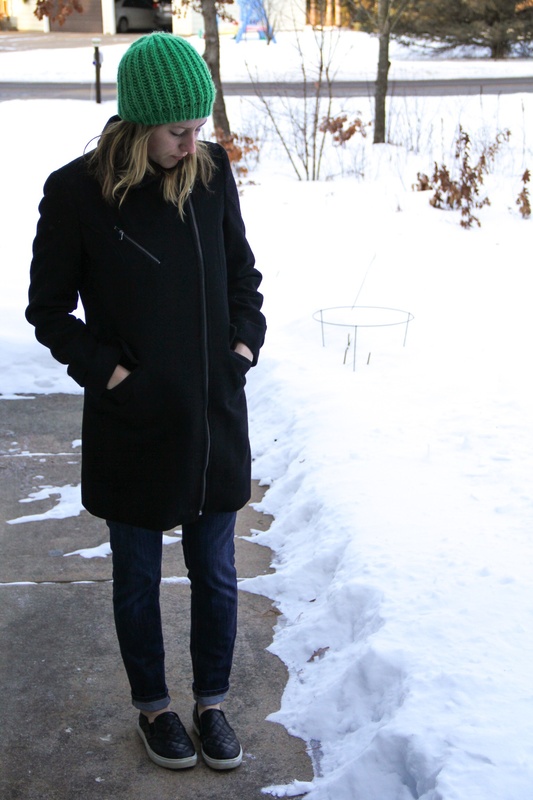 I did buy this black coat and shoes for my winter capsule because they were fantastic deals on clearance at Target. The timing was perfect too since I had just gone through all my clothes and wanted a few missing pieces to complete my winter capsule. 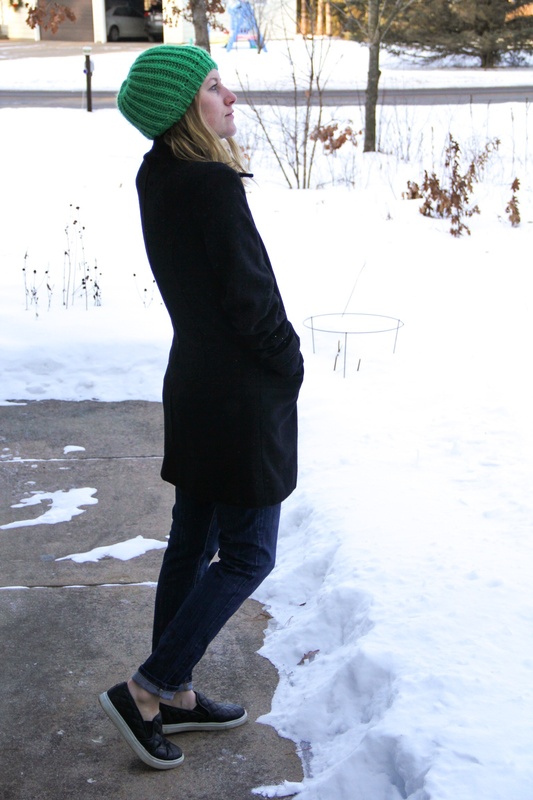 The coat costed me only $20 and the shoes were $5. (Insert jaw drop!) I had been seeing these shoes everywhere on blogs and knew I had to get them for myself. They are completely the perfect shoe for a mom who needs to be able to slip on shoes while holding their little in their arms trying desperately to get out of the door on time. Can anyone relate? Since most of my pieces are very neutral in color, I always like to add in a splash of color. Hence the bright green hat. I’ve had this for a few years and it’s held up long enough for me to keep using it. And with the temps being just about 0 here in Wisconsin I need something to keep my head warm. 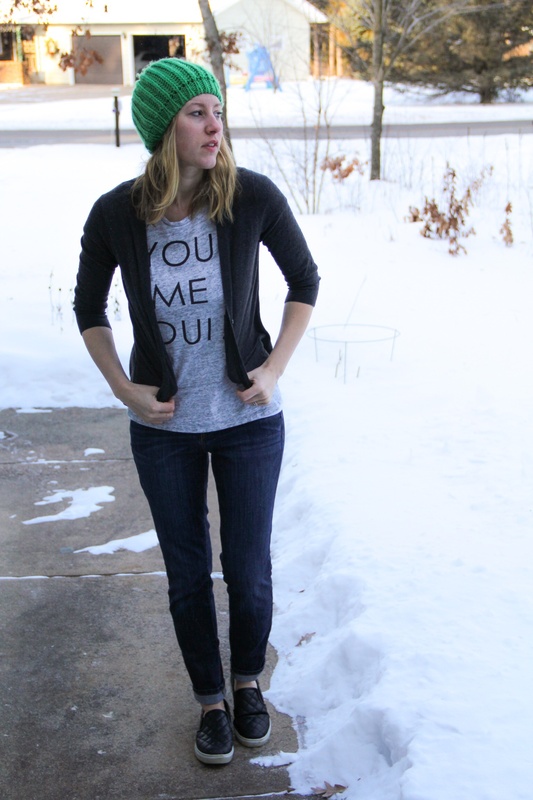 The rest of the outfit is something I live in- casual shirt, cozy cardi and my good & faithful skinnies. Nothing beats casual comfort right? Here it is all together. Here’s with the jacket off. Brr…. Anyone else try a capsule wardrobe before? I’d love to hear if you have tested this out and if you know any tips that worked well for you. I’m still on my first trial and have a feeling there will be some tweaking for my next season’s capsule. Also, if you have any questions please feel to ask away in the comments below. Hope you are all finding some fun ways to get through these winter months. This was my fun little project and so far it has been worth it. Give it a try! Disclaimer: I am not affiliated with the blog Un-fancy. Any opinions or suggestions above are mearly my own. I have gained much insight from the blog and found it to be a good resource so that is why I wanted to share it on this post. 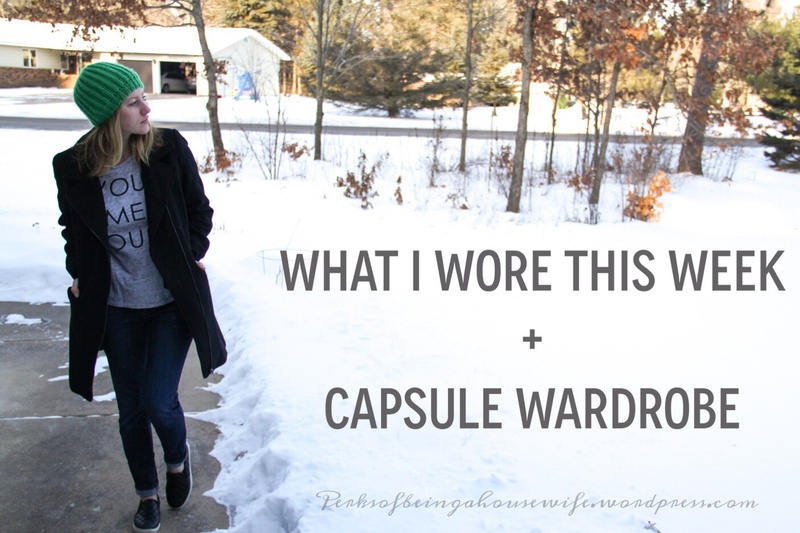 I love the idea of a capsule wardrobe. Wasn’t sure what it was at first but after asking questions and then looking into it, it actually seemed like a great idea and it was so fun to do. I looked into the project 333 which is the same thing & it’s 333 for “33” pieces of clothing for “3” months. Without including tank tops, I was able to narrow it down to 33. It was so much easier than I thought. 2. Getting ready is so much faster and lots less laundry too! 3. I actually feel more “styled” because when you narrow down your wardrobe you do have to figure out a style/theme so things mesh together. So that’s been fun. 4. It prevents you from shopping too much and helps you shop well. You know the pieces you need or want to add in when you do your next capsule so you shop just for those things and can feel guilt free spending a little more to buy those items quality made since you won’t be buying anything else. So I’ve enjoyed this so far and I look forward to creating my spring capsule at the end of March 🙂 Yay! I’m so happy to hear you are enjoying it! I am inspired by your number being down to 33. Way to go! I love how you mentioned feeling more “styled”. I feel the same way! Thanks so much for sharing!